» Compressor repair to the rescue! you down with FCP? This is what the opening screen looks like. And this is what Compressor Repair found! Weird, right? I did what it told me and reinstalled from discs. Voila! I’m back to work! I know that many people will say that Compressor repair didn’t actually fix anything. 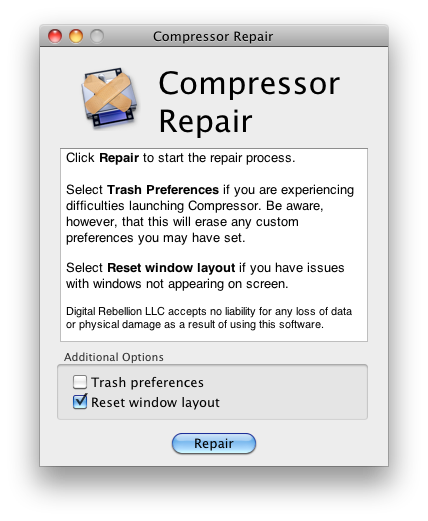 Reinstalling compressor is a somewhat logical step in troubleshooting too. 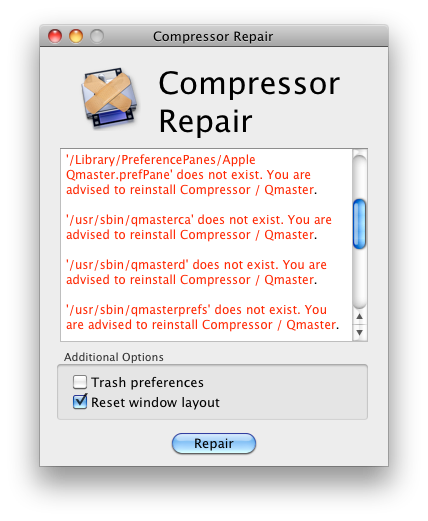 What Compressor Repair did do was to tell me WHY I should reinstall. It told me that there were missing files. Nothing short of a reinstall or restoring from a backup could have helped me then. Compressor Repair saved me the trouble of reinstalling all of Final Cut Studio and it got me back on my feet much faster. Best of all it is free! Keep it in mind for when the sailing isn’t so smooth, and hopefully it can save your day as well. PS digital rebellion makes a few other FCP related apps as well. I haven’t tried any of the others, but by the sound of them, they seem helpful. In addition to a bunch of smaller apps like data rate calculator, they make “FCS Maintenance Pack” , “FCP Versioner”, “FCS Remover”, and “Preference Manager”. ~ by ross on November 30, 2010.